Getting Started in model Engineering. Getting started in model engineering is a bit daunting and can be a significant investment as there are specialist tools available for every job. However the reality is that very fine models can be produced with some hand tools and a few key pieces of machinery. There are even models build by people who only have hand tools, but because we are talking about engineering here I will assume that there is some interest in owning and using machine tools. This getting stared guide should hopefully encourage the reader to have a go and also serve as a guide to which tools are needed and an order for them to be purchased as funds allow. Amongst the box of hand tools a model engineer will need a centre punch and small hammer, a digital caliper, scriber, dividers and an engineer's square for marking out. Also a selection of files, a hacksaw, a vice, some small screwdrivers, and some clamps for cutting and shaping. Many households already own some of these tools, but in any case, investment here is minimal and many tools can be purchased over time as needed. Additionally some taps and dies will be needed to cut threads. These are probably best bought as needed by the projects being worked on, as complete sets can be expensive. If you can standardise on a thread type such as metric or BA or ME, then this will reduce the number of threading tools needed and the quantity of screws held in stock. 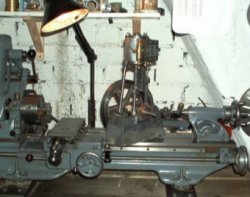 The lathe is the centre piece of the workshop and even the most basic device will enable the operator to turn pistons, bore cylinders and true up flywheels. Access to a lathe can greatly improve the finish of a model and make the manufacture of accurate parts much easier. Given some additional accessories the lathe can also be used for drilling, facing, milling and sawing, making it one of the most versatile of machine tools. The greatest influence on which lathe to purchase is to ask what it is to be used for. 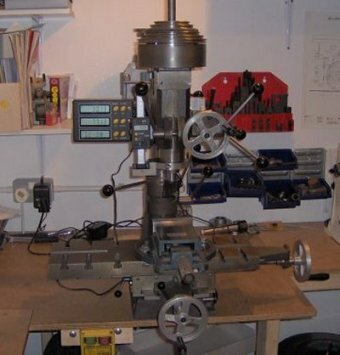 A typical mid-range, hobby lathe will have a centre height of 3.5". This would be suitable for building a locomotive of up to 5" gauge. Larger lathes can obviously machine larger parts but they are less sensitive, so if you are looking to make clocks or watches then a smaller, lighter lathe would be more suitable. When reviewing lathe specifications also consider the height over the cross slide which will inevitably be much less than the centre height. If the lathe has a 'gap bed' then it will be able to produce larger diameter parts of a limited length. Overall Length of the lathe bed is less important, as 90% of turning is done within 6" of the headstock, so only consider a long bed machine if you are sure you need it. The cross slide on the other hand can't be too long; a longer cross-slide can hold more accessories, such as a rear tool post or a milling table. Old English lathes can be a good buy; they are often well made and can last a long time. However they may be imperial unless converted and may have suffered wear or a hard life. New imported lathes can offer good value for money and there is a nice selection of sizes to choose from. These are invariably metric but are often only able to turn small parts because of the diminutive motor specifications. I have tried a small lathe of this type and the finish and accuracy or parts produced was perfectly adequate. However the controls suffered from excessive backlash and it was limited to turning small parts (<50mm diameter) because there was no reduction gear and no gap in the bed. Nonetheless a lathe of this type would be better than no lathe at all. A note about Spindle speeds. These typically don't need to be very high. High speeds are needed in woodwork but when cutting metal, having a rigid machine and a sharp tool is much more important. In appropriate high speeds can generate heat and just cause tool wear. A lathe with a speed range limited to 50rpm -> 500rpm is more useful in metalwork than one which can run at 2500rpm but doesn't go slower than 500rpm. A back gear. This is a reduction gear which can enable a lathe to run much slower and turn much larger parts. If the lathe has a gap in the bed then a back gear is needed to make full use of it. A variable speed in not the same as it doesn't provide the increase in torque. The low back gear speeds are also needed for safe screw cutting. A gap bed as already mentioned will allow the lathe to turn larger diameter parts of a limited thickness. The majority of items turned on a lathe tend to be long and thin, such as crankshafts, spindles and columns; or short with a large diameter such as flywheels, driving wheels, pulleys and cover plates. 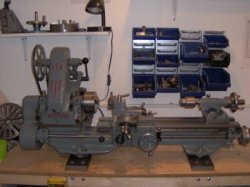 A lathe with a gap in the bed matches this spread of parts perfectly and so it is a desirable feature to look for, especially when combined with a back gear. Large through spindle hole. The headstock spindle will typically be hollow to allow long thin bar to be worked on without cutting to length to fit it in the chuck. The larger this hole is, the less you will need to pre-cut bar stock before turning and consequently less material will be wasted. Both a 3-jaw self-centering and 4-jaw independent chuck will give the greatest flexibility on the lathe. It is also worth noting that the 4-jaw can do everything a 3-jaw can do and more - it is just that there is more set up time involved. However for getting started and provided you are not using castings, a 3-jaw chuck is a nice starting point. It will clamp hex and round bar roughly central to the lathe axis and should enable basic machining and modeling to commence without lengthy set up. However it is worth ensuring that the 3-jaw comes with both internal and external jaws for added flexibility. When upgrading to a 4-jaw independent, a DTI will also be needed to enable parts to be centred accurately. 4-jaw chucks are useful for holding irregular shapes and turning castings. The 4-jaw can also be used to produce square and rectangular parts by rotating the stock in the chuck and facing each exposed face. Tailstock chuck. This is needed to drill holes along the centerline of the lathe. A chuck of 1/2" capacity is adequate for most jobs, anything requiring a larger hole can often be bored. The larger chucks also have a disadvantage that they cannot grip very small drills. 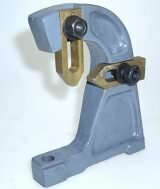 The Tailstock chuck can be used to hold threading taps, when the machine is turned by hand. Lockable cross slide and saddle. Locking the slides gives maximum rigidity when boring between centres or using the vertical slide (see below). Although useful when they are needed, they are not often required and can usually be added to a lathe which a bit of ingenuity. Vertical slide. The vertical slide enables small milling operations to be carried out on the lathe. 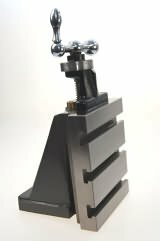 It is a very useful accessory, although facing operations (if not too big) can be clamped in the 4-jaw and machined that way. However, the vertical slide can also do co-ordinate drilling using the handle dials, and cut slots and steps which is not possible with the chuck. Travelling and fixed steadies. Travelling steadies are attached to the saddle and support the work close to the tool as the tool moves along. These are useful for turning long thin pieces and reduce the deflection of the work piece due to the force from the tool. Fixed steadies attach to the lathe bed and can be used to support a work piece with a large overhang in the chuck. As the steady doesn't move along with the tool, the outside length of the work piece cannot be machined, but if you are trying to square off a piece of tube to make a boiler for example, the fixed steady is perfect for supporting the outer end near the cutter. A small outlay compared with the lathe should allow ownership of a pillar drill. The options are floor mounted, or bench mounted and there are machines with more or less spindle speeds. Again it is a case of selecting a machine which best suites your proposed projects in terms of capacity. My pillar drill is bench mounted with a 1/2" chuck. This is good for most jobs and, for the small outlay, is worth every penny. My drill has a keyless chuck which is nice and convenient although it needs to be firmly tightened on the larger drills to stop them slipping. A range of speeds is needed to use both small drills and larger tools such as hole cutters, but 3 to 5 speeds should be adequate. My drill is used on a middle speed for 80% of the time. As with the lathe, a drill with some low speeds but no high speeds is more useful in metal work than a drill with really high speeds, but no lower speeds. A depth stop feature is another useful thing to look for on a drill press, as this can enable matching hole depths and countersinks to be machined. You will also need to add in the cost of a drill set to get started. Go for HSS drills where possible and they cut much better and last much longer than high carbon drills. A lathe with some accessories and a pillar drill should enable a generous number of models to be produced of various types. More specialised tools can be picked up as needed or manufactured on the equipment you already have. 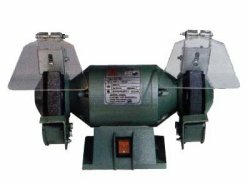 A bench grinder is a useful machine for making punches and grinding your own lathe tools. They are not a large investment and the usage will depend on what sort of projects you work on, but they are also useful for sharpening chisels and lawn mower blades if nothing else. 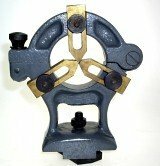 If you are grinding lathe tools then an adjustable rest makes accurate angles much easier. Not to be overlooked is the cost required in gaining somewhere to use the machine tools. However once again, high investment is not necessarily needed - you don't need a fully heated double garage to get started in model engineering. A dedicated building to work in is nice if you have the room and money. 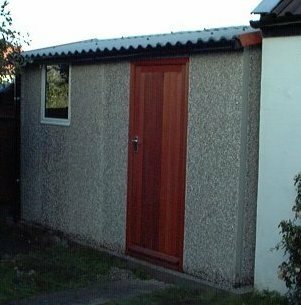 A wooden shed is a good start and of course if can't be too big, but even a standard 6ft x 4ft shed will accommodate a bench and small lathe. If using a wooden building, consider adding some background heating to stop tools from rusting and try and add some insulation. Windows are not needed as they are not secure and use up valuable wall storage space. You will need some lighting and power sockets though. If a dedicated building is not possible, then a corner of a room, or a couple of draws in the kitchen may be all that is needed. I started with a lathe in the kitchen which was stored under the worktop and then lifted out when it was needed. Not very convenient, but better than nothing. American machinist and author Rudy Kouhoupt produced some plans for a workshop contained within a writing desk. These sort of ideas many not be what was in mind when you set about model engineering as a hobby, but they do demonstrate that the classic workshop in the garden is not the only solution available. Many of the small lathes for home use run incredibly quietly and are not too intrusive when used in the house. Obviously the grinder is less quiet and dusty too, so this should be kept in the garage or outside in the porch. If after this initial investment you should be well equip to make lots of interesting models and tools, but should further machine tools be required then next on the list of things to have, would probably be the Milling machine. Unlike the lathe which, with suitable gap and back gear, can handle work outside of its normal range, the milling machine is almost the opposite and can only produce work well within its capacity. Milling machines although often very heavy with a large table area, can often have a fairly short range of movement. The other reason milling machines have to be so substantial is that they use a multi-point cutting tool rather than the single point of the lathe; this means the power of the machine is divided into the number of edges cutting at any one time. The cut on each tooth is intermittent which is a source of vibration and there is also a certain amount of tool rubbing involved which further loads the machine frame. All of this means that milling machines have to be quite large to be rigid enough to avoid vibration and produce a good surface finish. A vertical milling machine is more flexible than a horizontal and is more suited to the work required in model engineering. Some machines have interchangeable heads and can do both vertical and horizontal operations and this gives the best of both. Vertical machines can be used for co-ordinate drilling and can be combined with a rotary table to cut curved slots. If a dividing head is available, then gear cutting also becomes possible, although both the cutters for this and the dividing assembly can be expensive. The greatest advantage over milling in the lathe is simply that the capacity is much greater and this means you can mill things like locomotive frames, and long connecting rods. If a mill is purchased then you will almost certainly need a clamp set and a milling vice of a reasonable size to get the most from it. A wobbler is also useful for finding datums. When looking at milling machines pay close attention to the table travel and also the clearance available in the Z-axis. As already mentioned a large machine can be quite limited and these numbers define the working area more accurately. Rotary tables and large vices take up a lot of the Z-axis so this must be factored in as well. In summary Milling machines are not needed to get started in model engineering. They are very useful and if you are able to include one in your workshop then you won't regret it, but it is certainly not essential to get started. 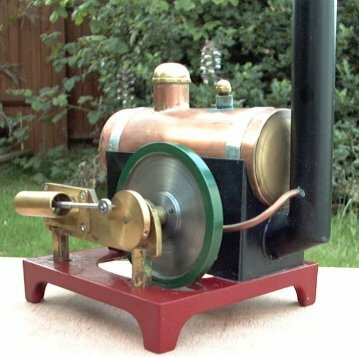 Hopefully this page has given the inspiration to have a go at model engineering and has provided some tips on machines and tools needed. Once you have a lathe, these pages give some techniques for using it. And this page gives details for a beginners project.